Smartphones and tablet devices are selling like hot cakes, bringing the day faster when mobile devices will rule both personal and commercial spaces. The pace at which network technologies are evolving, 4G and WiFi availability continues to grow, and applications are emerging, an interesting shift can be seen in the way “mobile web” is expanding its horizon. 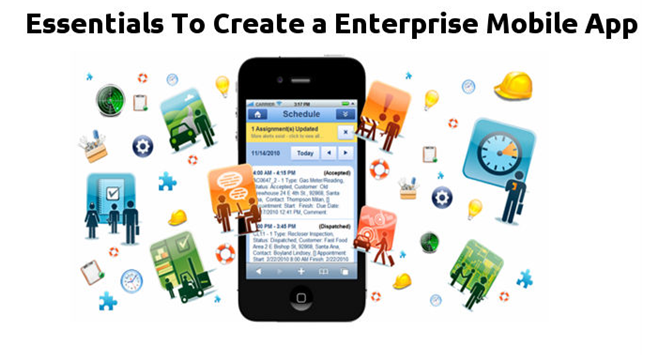 Enterprise mobility is a concept that's taking shape enormously. As per the Internet Advertisement Bureau, people spend maximum time of their day looking at their mobile devices. Employers are smart enough to take advantage of this habit of obsessively tapping our devices every now and then. This is something which has influenced the growth of enterprise apps. With these task-specific apps, employers are trying to make it easier for their staff to stay agile and productive on the go. Your application interface has a massive bearing on the way it is perceived by your users. It should be clean and intuitive enough to provide its users a pleasurable and meaningful experience on the go. For this, there must be a strong collaboration between both designers and developers team. They need to work together to deliver best ways to influence the enterprise productivity altogether. Both teams put efforts to gain knowledge about different users and their purpose of using apps. Each worker has its own role and field of operation. A worker of manufacturing team has an entirely different work with that of accounts. Your app must be smart enough to help them achieve their different needs while offering all the basic functionalities. In addition, consider the inclusion of short and simple macro functions and not to overwhelm them with too much information. Your screen should give them enough information to make planned choices and quick decisions. Authentication- This is probably the most important and vulnerable part of an app. The need of providing user credentials such as user name, log in and password has further put it in need of special care. Given to the short development time, it's quite daunting to implement a solid authentication from scratch. For this, an integration with the enterprise's LDAP is required for a desirable authentication. It also offers a single-sign-on across a variety of enterprise apps. Server-side Validation- It's critical to ensure a proper check and implementation of validations on the server, instead of the client side. This approach has two benefits- it ensures to upkeep your app performance, and logics will remain up-to-date because of its location on the central server. Data Encryption- It's a nice practice to always keep a sensitive data encrypted, especially when it is stored in mobile devices. This is accomplished using a secure container that keeps the app safe if in case the device is lost. We have crossed the time when updating a software was a rare occasion. Today, the scenario is completely different as applications need to be updated frequently to cater your user needs. For example, the latest version of Android Lollipop comes with thousands of new APIs, and the majority of them are focused on enterprise. In future, there will be more demand for updates and developments that developers find ways to deal with. These updates should focus on work-related activities and must address a number of business needs in the manner most effective. Enterprise mobility is gaining momentum and it seems as if currently winning the battle when it comes to making workers productive and keep them current to the work. So, implement these tips and let your workers deliver best solutions in an easier and faster way. Addison Cohen is a mobile app developer working with Appsted Ltd, the leading iPhone application development service provider which delivers most comprehensive mobile application solutions. He loves sharing latest information on mobile technologies like iOS, Android development processes.